Experts are interviewed by a group about a certain topic, a municipal issue, a project, or something similar. The moderator welcomes the participants and the experts and opens the event with a few words. He/she also gives a brief overview of the process and procedures. Now the experts get to speak, introduce themselves and briefly introduce the subject (about 5-10 minutes) from their perspective. Thereafter, the participants ask the experts questions. They can ask questions prepared earlier but can also form new questions on the spot. Each question is answered immediately. 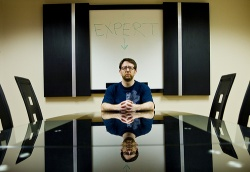 The moderator ensures that the experts respond to the question asked and don't wander from the subject. Participants have the right to ask follow-up questions until they get a satisfactory answer. The moderator (clearly) writes keywords from questions and answers on a wall paper or on index/prompt cards (long cards for questions, rectangular cards for answers). Written cards are hung on a pinboard for all to see. This creates a parallel shared log, which all can see and which makes it easier to stay with the central theme of the discussion. In addition, this ensures that no valuable tidbits or ideas are lost. After the questioning round, a discussion often develops. This should be scheduled accordingly. Without prior preparation, an expert questioning activity makes little sense, and it should thus be carried out only after appropriate preparation (e.g. literature review or internet research).